An angry customer who receives a broken product in shipment results in one of the most disappointing negative feedbacks an online seller can get. Not only is it upsetting for both parties, it's also one of the most preventable negative experiences. I once sold a three-piece set of nesting Italian terracotta serving bowls with a smooth white glaze. I placed some newspaper between each bowl and stuffed some more around the edges. The buyer anticipated giving the bowls as a gift to a friend who had been looking for the set. Needless to say, they were upset when they opened the box to find all three bowls cracked in two. I was new to selling at the time and I didn't understand the ins and outs of shipping. I assumed the bigger the box, the bigger the cost. My inexperience resulted in broken pieces because I was trying to save on shipping by using smaller boxes. What's more, some really nice pieces of work wound up in the landfill. After a couple of sales that resulted in breakage during shipping, I swore off selling breakable items. I tried to imagine what it must be like for a box to travel through the postal system. As soon as a package leaves our possession, it is placed in a large basket where other boxes are collected. From there, it is routed through various hands, conveyor belts, baskets and trucks. Among all the boxes our package travels with, some are heavier and sharper, and could possibly crush our package as they tumble into large bins together. When I shared this idea with a postal worker, they confirmed my imagined scenario was close to the real thing. This is why shipping carriers recommend you give a good two inches of padding between your fragile item and the box. 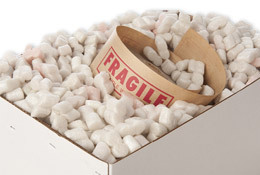 While a bigger box does figure into the cost of shipping, what matters most is the weight of the package. 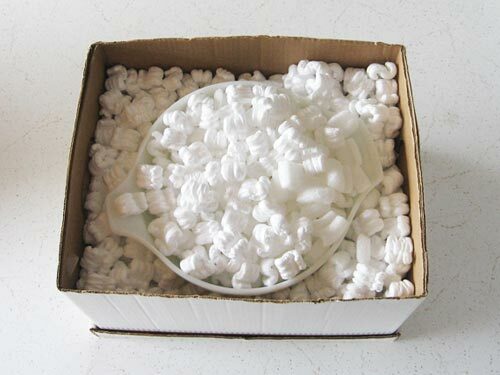 A bigger box means added weight only from the extra cardboard and packing materials, which usually amounts to very little. Newspaper is not recommended for packaging material. Not only is it below professional standards, but it's also quite heavy. Take a stack of newspapers in one hand and a huge bag of packing peanuts in the other, and you'll see what I mean. The next thing to note is the size of the box. The U.S. Postal Service accepts "packages or thick envelopes" with a maximum length (the longest side of the package) plus girth (distance around the thickest part) of 130 inches. Anything larger is considered a "large package," which will cost more. Likewise, UPS and FedEx accept packages as long as 165 inches plus girth before they start adding costs to your shipment. 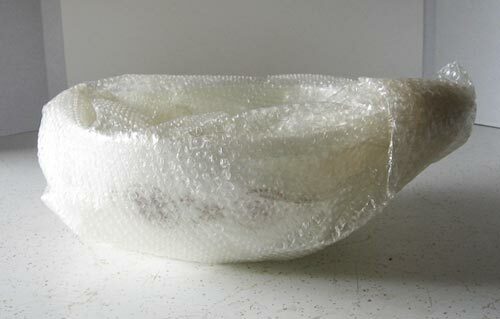 To give an example of how to package a fragile item, I'm preparing a shipment for a large vintage Pyrex mixing bowl. I first placed it in a box that fits the bowl nicely, but doesn't allow much room for padding around the edges. The first package weighs 3 pounds, 12 ounces, and has a 35-inch girth. USPS shipping cost: $13.58 for standard, or $18.35 for Priority Mail. Then I placed it in a bigger box to allow for more padding. The second package weighs 4 pounds, 8 ounces, and has a 46-inch girth. USPS shipping cost: $14.20 for standard, or $21.20 for Priority Mail. For standard shipping, the cost is only 62 cents more. 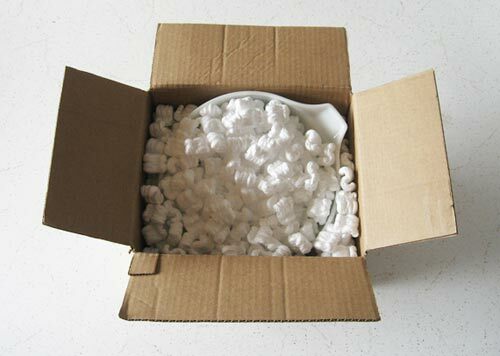 Now that I've selected the appropriate box, I'll show you how I packaged this fragile item to ensure it arrives in one piece. First, I placed a couple layers of lightweight, reliable packing material on the bottom. I used packing peanuts for this. I then covered the dish with bubble wrap for added protection. Take extra care for protruding pieces, such as the handles on this bowl. Place the product in the box. I angled the handles toward the corners to give them more space. 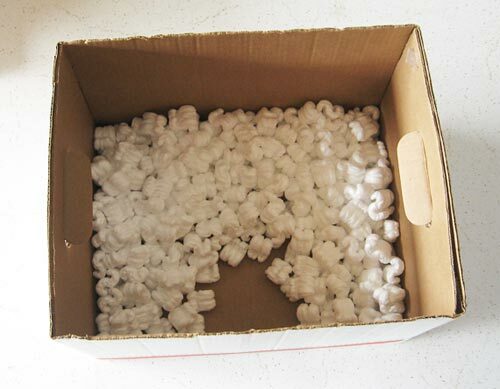 Fill the empty space with packing material. Stuff the sides well. Now, close the box and give it a little shake. 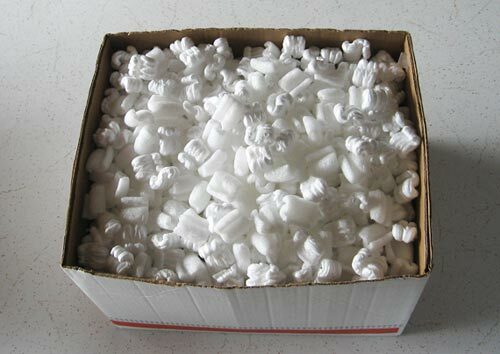 If the product is shifting around, add more packing material. Then seal your package. I decided to wrap this package in brown paper for a more professional look. 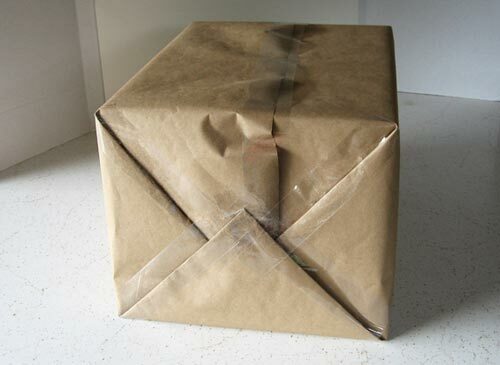 Whether you wrap your boxes or not, be sure to seal lids, edges and corners with packing tape. Now that I'm a more experienced seller, I've gained confidence in my packaging skills, and have once again added breakable items to my listings. I try to collect recycled peanuts and bubble wrap when possible, but otherwise I purchase a large bag from the local U-Haul for $5. These days, I get glowing feedback about how well my items are packaged. I hope you will, too. Do not use the foam peanuts. Your items will settle down through them and get broke. Newspaper is the way to go. 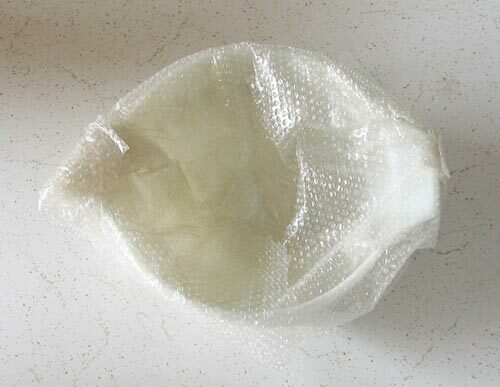 My experience in packing high-price glass items is to bubble wrap as your article describes, place it inside a box and secure with more stuffing. Then place that box inside another box that has the 2" spacing that has also been stuffed securely. I also test for jiggles, rattling, etc. before final taping. So far, it has protected those items from damage. From what I understand, brown paper on the outside is heavily frowned upon. 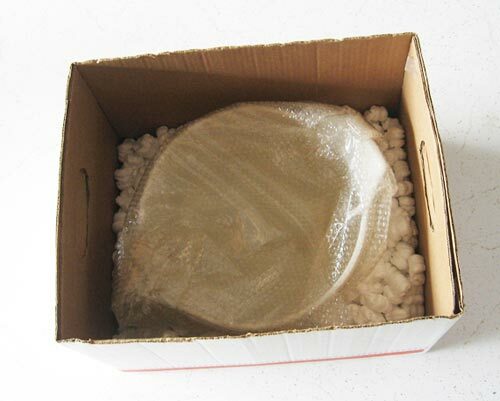 If (or WHEN) it gets ripped away by handling, there is nothing underneath to tell where the package is destined.